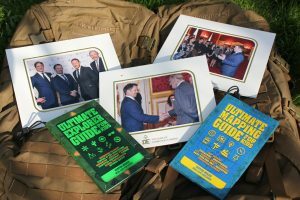 Justin Miles, the inspiration behind ‘Teach The World’ has been given the honour of presenting the ‘Duke of Edinburgh Gold Awards’ during a ceremony at St. James’ Palace alongside HRH The Duke of Edinburgh, Prince Phillip. For the past seven decades, the ‘Duke of Edinburgh Awards Scheme’ has inspired and transformed the lives of millions of young people from all walks of life. From volunteering to physical activities, life skills to expeditions, achieving a DofE Award is a passport to a brighter future, recognised as a significant achievement and valued by employers and universities. Justin was invited to join HRH Prince Phillip because of his relentless work in education, his passion for encouraging children to get active outdoors and his drive to help children from all walks of life all over the globe to succeed. You can find out more about the Duke of Edinburgh Awards Scheme here.